The streets of London are very distinct in the curious and particular sights that you will encounter as you meander from one alley or cobble-stoned street to the next. There is such a vibrancy of diversity in both people and architectural structures that there is no shortage of interesting things that will catch your eye! On a recent jaunt down the A502 in London on our way to the Stables Market. It was quite obvious that the people we encountered were from a variety of life paths with a wide diversity of interests, characters and hobbies. There was the man who was in his later golden years who was wearing pants (but no shirt) and listening to whatever musical beat via his ear buds that was making his feet do a jig in a small circle. As my son and I stood there entranced, watching him, we noticed that he was so very content in his own world, oblivious to those who were walking up and down the street around him hurrying to their destinations. Then there were the punk rockers who were posing for a picture with a young boy as the mother took pictures. Their hair was quite a colorful display in dyed colors of green, yellow, and blue with a touch of sparkle in the shape of very tall mohawk. Very similar as to what you would find at a county fair. In order for them to get the lift and rigidity to their hair they had to alternate spraying it with hairspray and hair glue as they blow dried it into shape. They really were quite pleasant to talk to. Just one of those crazy hair days! 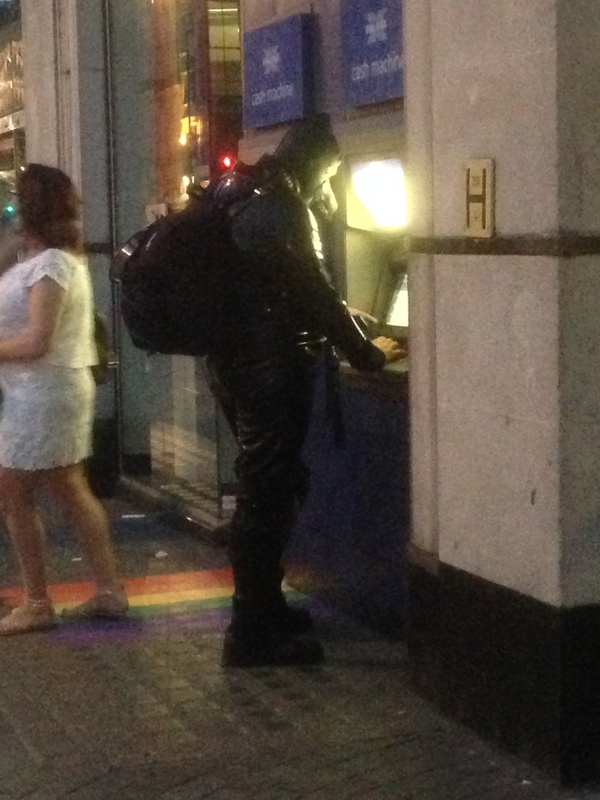 While we are on the topic of “you just never know what you will see”… We encountered this gentleman dressed in a black latex suit complete with a dog mask withdrawing funds from an ATM. I just can’t help but wonder if he was thinking, “dang, I should have done this before I got dressed for the party” or what? Guess he forgot to get cash before he got dressed! When in Rome do as the Romans, or, er, in this case the Londoners and everyone knows that when you are in England, you must have tea. 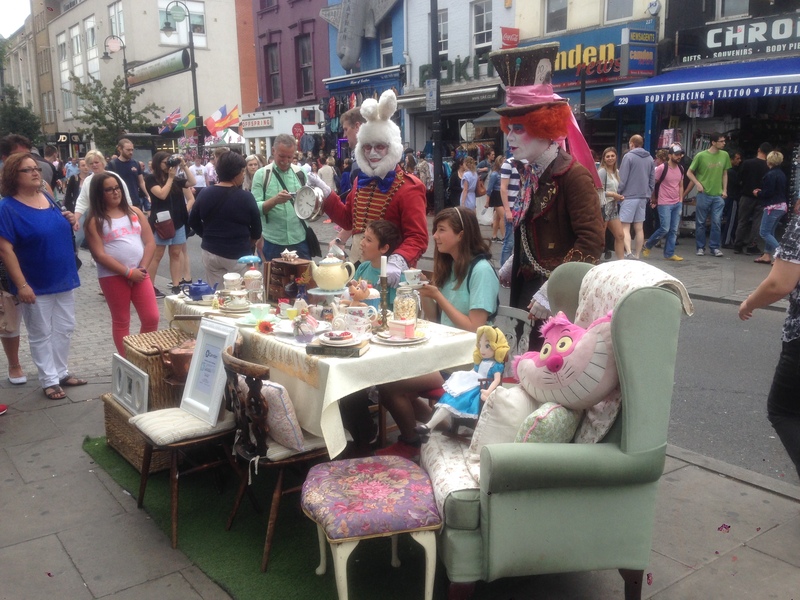 So how about a tea party in the street, with the Mad Hatter and a few of his friends! Like I said, London is so diverse and unique, you just never know what you might see, so keep your camera handy! What are some of the most memorable, unique and interesting people who you have met on your travels? I would love to hear from you!